One lane of the A90 southbound carriageway will be shut while works are carried out at Cowie Bridge, near Stonehaven. The closure will only be in place at night time, but the work is expected to take 12 weeks. The Bear Scotland project begins on June 22 and involves resurfacing a section of the carriageway and carrying out further upgrades to the parapets and safety barriers. Bear Scotland’s north-east representative Andy Thompson said the road surface had been damaged at the start of the year and has already received temporary repairs, he added: “This project will allow us to permanently repair the road. Work is also about to start on Royal Deeside’s Polhollick Bridge which was badly damaged during Storm Frank in December 2015. The listed structure was stabilised last year, but remains closed and is still deemed “unsafe”. It is hoped the repairs will be carried out over the summer and completed by November. 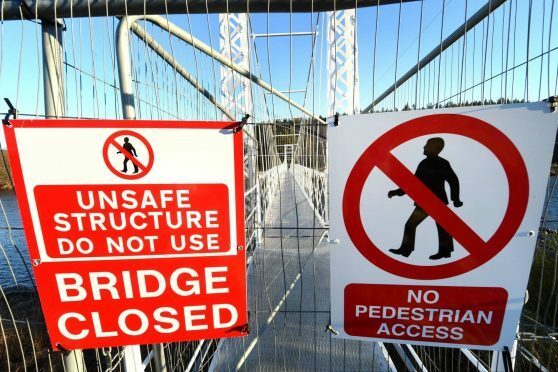 One of the Dee’s other footbridges, Cambus O May is now also being considered for repairs and Aberdeenshire Council has confirmed the funds are in place. Both bridges were affected by the extremely high river levels during Storm Frank and were struck by trees, caravans and other debris being swept down the river. Chairman of Aberdeenshire Council’s infrastructure services committee, Peter Argyle said: “The fact we are still seeing work to repair damage inflicted by Storm Frank reminds us just how significant an event that was, and the severe impact on Aberdeenshire’s infrastructure. “Given the amount of work and money required around the area, clearly prioritisation was important to make the best use of resources, and I’m glad there’s a date for the completion of repairs to Polhollick – it’s important to the local community and gives access to some of the fantastic walks around the area.